Coming over from the SVOGI thread and the Physical Lights thread I decided to make a new thread and see if there's any interest on this. The point is an attempt to repurpose the Reflection Captures into Localized Image-Based Lighting. The expected result would be a setup of baked ambient lighting (without using Lightmass) that goes beyond the limits of a globally-affecting skylight, that can co-exist in a dynamic lighting setup. The most important use case would be indoor-outdoor ambient light differentiation, such as going inside a house or cave and not having the skylight affecting it. This is a commonly requested feature that is so far not addressed. 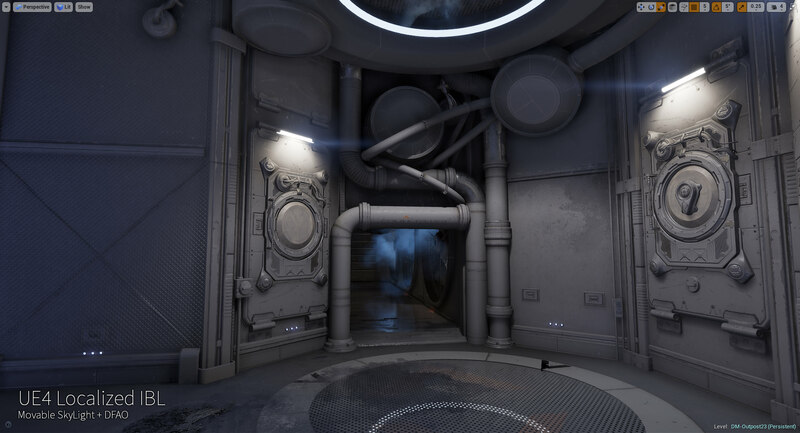 Up to UE4 4.11 there was a hidden feature called DiffuseFromCaptures which apparently was a way to contribute to lighting via reflection captures but it felt very short at it, and was removed anyway. Upvote / like / share / etc! You'll need to re-compile all Translucent materials manually, since the flag is not propagated for those until the shader is compiled. The gist of it: Reflection Captures are passed over as IBL in the form of ambient light using the highest mip of the reflection. Localized IBL is applied in the same shader as the light from the SkyLight, but areas affected by IBL are no longer affected by the SkyLight (smoothly blended). This effectively allows using Reflection Captures as "skylight blocking areas" even if ambient light from Localized IBL isn't wanted. Dynamic lights are captured into IBL based on the existing 'Indirect Lighting Intensity' property of each light, which can be set to 0 to make it not contribute any light to IBL. This is useful to skip capturing lights that are expected to change during gameplay. Last edited by Chosker; 08-13-2018, 04:57 PM. Why would you want to do this in the first place if not for fully dynamic lighting? So the fact it cant capture movable lights makes it in my eyes useless, because I would never use stationary lights for a dynamic light setup as they, as far as I understood, dont support shadow caching like the movable ones do and anyways, they are meant to be baked. The complaint is that we cant work like in Cryengine for dynamic lighting, so if we cant capture movable lights, does this not mean this whole approach falls apart anyways? Maybe am wrong, but in Cryengine all lights are always movable right? Just some thoughts^^ But nevertheless...highly appreciated work man! I remember, when we worked on DI2, reflection capture actors were actually capturing dynamic lights too. But that was around 4.6 or so I think. DI2 was using a lightprobe system and fully movable lighting. as much as I'd like this to work on a fully dynamic lighting scenario, as I mentioned reflection cubemaps are fully static on cooked. with this in mind the only use case that seemed useful is for lights that are "permanent" (even in a fully dynamic lighting scenario you'd hardly expect all lights to be toggled / moved). this would be the equivalent of adding fill lights. I had the impression that static and stationary lights would act as fully dynamic if the project settings have "Allow Static Lighting" disabled (that was the behavior in UE3 when disabling "use precomputed lighting"). With this you'd have everything dynamic but you'd be able to control which lights are never meant to change and therefore have them opt in into IBL. I could dive further into the engine code. I don't expect having dynamic lights captured into Reflection Captures should be a big issue to achieve. but unless I can also make ReflectionCaptures re-capturable in cooked I don't see the point. as soon as the light changes the IBL data would not match anymore. Last edited by Chosker; 06-26-2018, 05:30 AM. Ah I see...good thoughts man! So there must be a way to get the reflection captures to not be cooked as that's how it works when you use Enlighten for Unreal. The reflection captures have lower rez than Unreals default, but they all update on runtime during the game as well. So that can be done. Also, there must be code that tells the Engine to not consider movable lights but do it with Stationary ones. So it has to work with movable ones, they probably just don't sent the right signal as the other lights do. Also, the reflections don't need to update at runtime to work for movable lights! The texture has to be generated in Editor and then saved and stored and then just loaded with the game. Problem is Unreal doesn't do that and recaptures the map when the map gets loaded...at least to my knowledge. I actually hate the fact that UE updates captures without telling you! I wish it would never do so until you say it should. We implemented our own probe solution that got baked on the GPU and solved GI for us. So, in the end, it was like this: Movable sun + movable skylight + probes for GI + DFAO to shadow the dynamic skylight + the GI from the probes. Since the probes are super low rez by nature, you need something like DFAO for more accurate occlusion and shadowing. PS: I think reflection capture actors are streamable...so you should be able to have more than the 300 something if you have a proper streaming setup At least that's what we talked about with Epic back in the day but I don't fully remember. But we would have exceeded that limit with DI2 as well so that was the proposed solution. Last edited by Daedalus51; 06-26-2018, 06:20 AM. So there must be a way to get the reflection captures to not be cooked as that's how it works when you use Enlighten for Unreal. The reflection captures have lower rez than Unreals default, but they all update on runtime during the game as well. So that can be done. well when triggering a recapture the code specifically checks if it's uncooked, and otherwise it skips it. that's the part I would need to try to overrule but I assume there's a reason for that (the code explains that only static textures are expected). Also, there must be code that tells the Engine to not consider movable lights but do it with Stationary ones. So it has to work with movable ones, they probably just don't sent the right signal as the other lights do. Also, the reflections don't need to update at runtime to work for movable lights! The texture has to be generated in Editor and then saved and stored and then just loaded with the game. Problem is Unreal doesn't do that and recaptures the map when the map gets loaded...at least to my knowledge. Unreal specifically skips any recapture on cooked, which means it really does work as you expect it to work - texture is generated in editor, saved and stored as a static texture on either saving or cooking [not sure], and then the cooked game only loads the saved static texture. I've never experienced such behavior actually. for me the captures only happen when I hit recapture. maybe also on -editor- map load but I'm not sure. thanks for the insight. so with the DI2 setup, what would happen if a light is moved or turned off in-game? was there any recapturing at runtime or did the IBL not match the actual lighting anymore? changing lights during gameplay would cause you to run into problems unless no light was ever supposed to change in any way, and using dynamic lighting was just for convenience (iteration times and memory savings). In GTA or Assassins Creed even if you'd fix the time of day you can still have flashlights or torches. my main worry is how those get treated in relation to IBL (I guess any gameplay-spawned lights would just get ignored by the IBL, which would be acceptable). but then imagine a game like Thief where the artist-placed lights can be turned off via gameplay. maybe reflection capture Brightness can be changed at runtime which would fix artist-placed lights being turned off - but it wouldn't fix artist-placed lights that actually move. also world size is still an issue as UE4 is limtied to 341 reflection probe textures. it's not a terribly small limit so I think it can be worked with, but it means you cannot go very granular and have multiple probes per room in each building (like the UE4 apartment thing) in a big map with a lot of buildings. you need something like 1 probe per room which is I think still okay. Last edited by Chosker; 06-26-2018, 06:54 AM. TBH, I think no game updates their IBLs on runtime for stuff like players holding a torch! Same goes for AC or GTA. Local lights that are moving only have teir own specular highlight but are not being updated into the reflection IBL. A game like Thief probably has updating reflection captures to account for someone shooting a light off OR...and that what I think they do, they have 2 kinds of lighsources. They have stuff like streetlights etc. I think those are baked in and cant be turned off during gameplay. They render into the reflection probes. All the dynamic lights like candles etc DONT render into the reflection probes but only have their own specular. I think that's how they do it tbh. Playing AC: origins....they don't update anything. Their TOD just lerps though incl. specular probes but nothing updates dynamically based on player input. Yeah, for DI2 it was just about workflow and not about interactivity! So that's a super important point. If you would shoot out a light, it would still be there since the reflections were not recaptured. Honestly, I think it works well and the illusion also holds up quite good. People generally don't notice if the reflections are accurate based on a light source you are waving around with your hand. PPS: Yeah, maybe Epic changed the update behavior finally! Last time I really checked for it, an actor would instantly update when you move it or duplicate it for example. so finding out how to capture dynamic lights would be the next step for me. however I would still need a way to tag lights to be ignored by the IBL to still have the option of artist-placed lights that might change at runtime, but it seems doable. in AC: Origins the light from torches looks quite nice, I find it hard to believe it's a single pointlight specially because the shadows still get some color from the light (maybe they have a non-shadow-casting light on top of the shadow-casting-light to simulate some ambience). but I don't think they update their IBL at runtime for moving torches. PS: I don't think capture actors support streaming. if I remember correctly all reflection captures are stored in a single texture-array but I could be wrong. Sweet man! Super thanks for the nice info...I really appreciate conversations like this! Your ideas sound great, so I am honestly really curious where this leads you to! Last edited by Daedalus51; 06-26-2018, 02:51 PM. So I'm guessing you had to modify the C++ code to get this working? Is it it's own actor so to speak or does it replace reflection captures? It would be better if you could still use both. Making it its own actor also doesnt make much sense. Im reusing the ReflectionCaptures because they already have a probe capture array (you wouldnt want 2 such big texture arrays) and they are so similar that it doesnt either justify having them separate. The point is not to hijack the ReflectionCaptures functionality, that still already works and I have no intention of getting rid of it. Last edited by Chosker; 06-27-2018, 04:31 AM. this also means I don't really need to decouple the ReflectionCapture's intensity to affect reflections and IBL differently anymore, since the IBL intensity is already controlled by the light. Last edited by Chosker; 06-27-2018, 05:55 PM. I've been fighting the auto exposure and PPV cubemap. You go hardly find an approximately correct value for one thing, something else goes off, you patch that up, something else goes wrong. this is awesome ! more screenshots or maybe an video of animated Time of day would be awesome ! ...The point is not to hijack the ReflectionCaptures functionality, that still already works and I have no intention of getting rid of it. Oh that's awesome! You should load up a gumroad or something. I'd love to support you a bit as you work on something like this. Do you have plans to put it on the marketplace?